Step 1 Tap on the "Expenses" CheckedTextView, which is located on the Center of the screen. Step 2 Tap on the "Income" CheckedTextView, which is located on the Center of the screen. 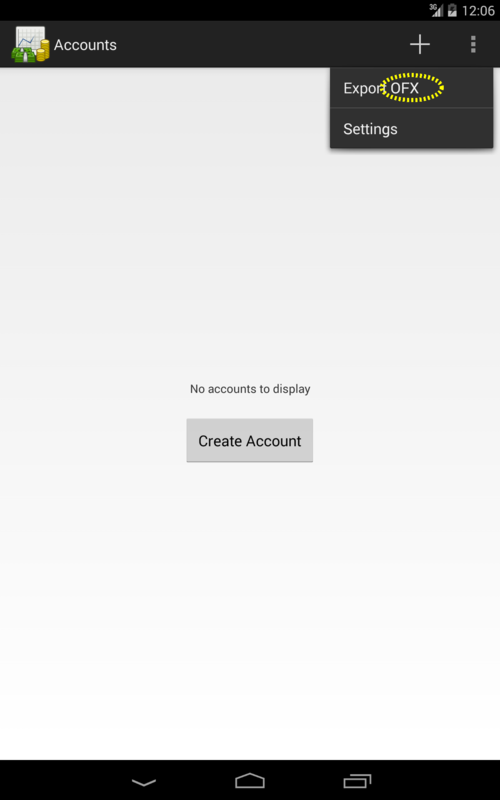 Step 3 Tap on the "Assets" CheckedTextView, which is located on the Center of the screen. Step 4 Tap on the "Entertainment" CheckedTextView, which is located on the Center of the screen. Step 5 Tap on the "Insurance" CheckedTextView, which is located on the Center of the screen. 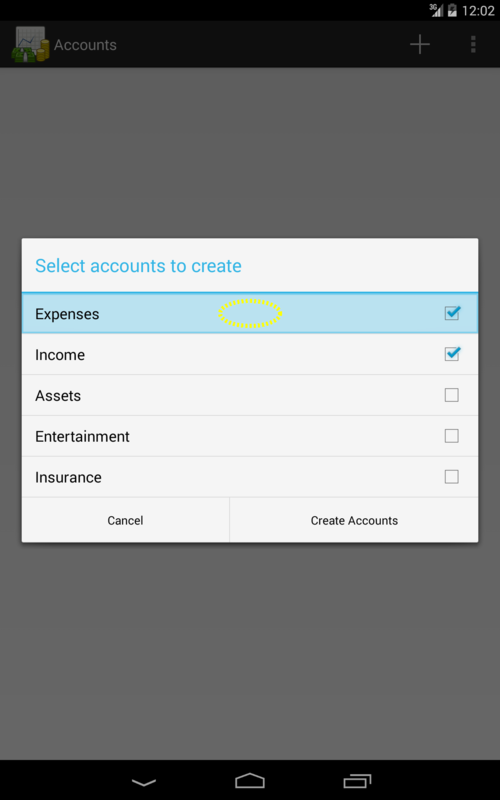 Step 6 Tap on the "Expenses" CheckedTextView, which is located on the Center of the screen. Step 7 Tap on the "Income" CheckedTextView, which is located on the Center of the screen. Step 8 Tap on the "Assets" CheckedTextView, which is located on the Center of the screen. Step 9 Tap on the "Entertainment" CheckedTextView, which is located on the Center of the screen. Step 10 Tap on the "Insurance" CheckedTextView, which is located on the Center of the screen. Step 11 Tap on the "Cancel" Button, which is located on the Center left of the screen. Step 12 Tap on the "Accounts" LinearLayout, which is located on the Top left of the screen. Step 13 Tap on the "" TextView, which is located on the Top right of the screen. Step 14 Type"sphvxvfrlq%sz" on the "Account name" EditText, which is located on the Center of the screen. Step 15 Tap on the "" Spinner, which is located on the Center of the screen. 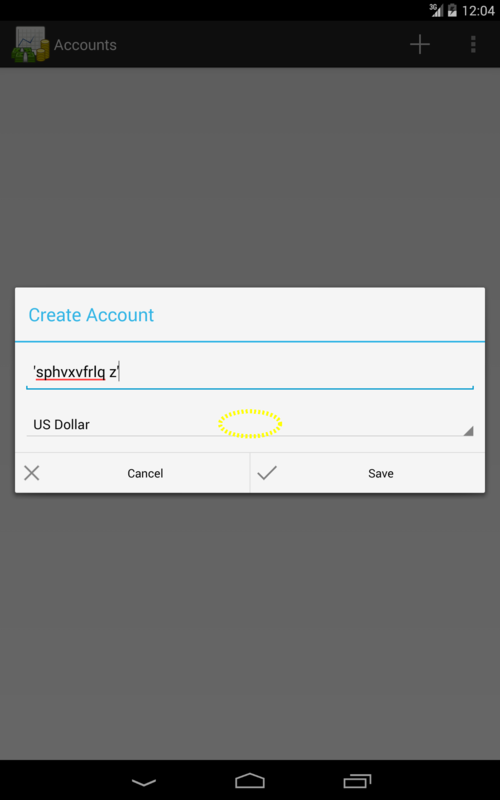 Step 16 Tap on the "US Dollar" CheckedTextView, which is located on the Top of the screen. Step 17 Type"ltmjfwjqss%sz" on the "Account name" EditText, which is located on the Center of the screen. Step 18 Tap on the "Cancel" Button, which is located on the Center left of the screen. Step 19 Long-touch on the "" TextView, which is located on the Top right of the screen. Step 20 Tap on the "" ImageButton, which is located on the Top right of the screen. 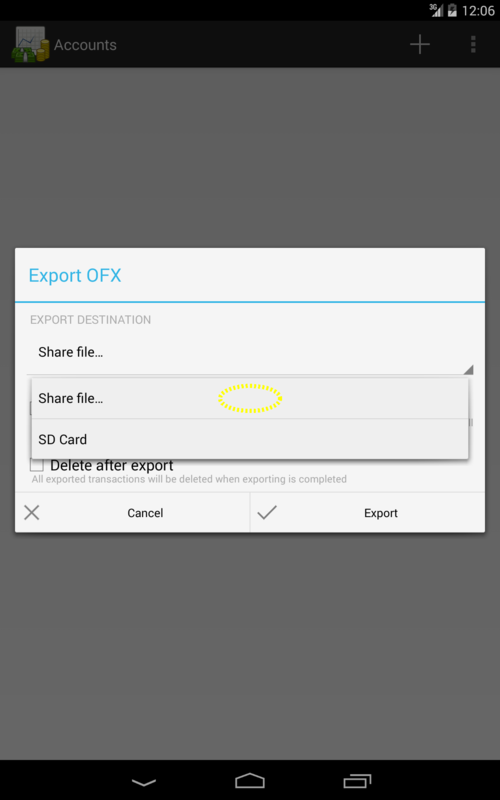 Step 21 Tap on the "Export OFX" LinearLayout, which is located on the Top right of the screen. Step 22 Tap on the "" Spinner, which is located on the Center of the screen. Step 23 Tap on the "Share file…" CheckedTextView, which is located on the Center of the screen. 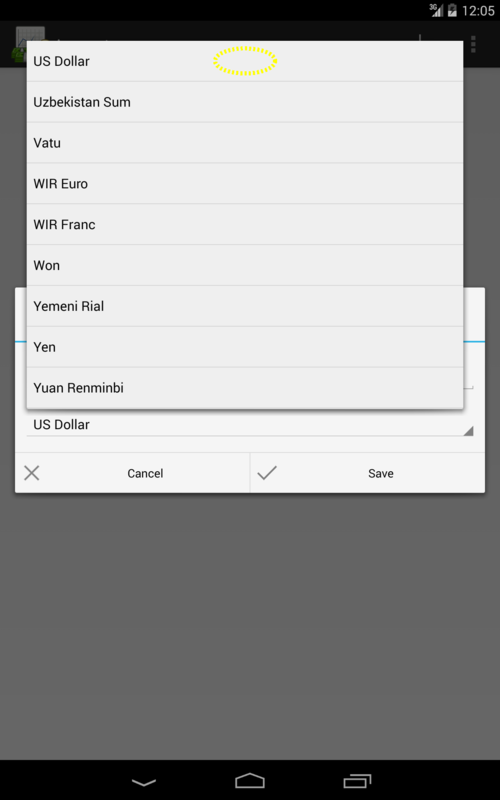 Step 24 Tap on the "Export all transactions" CheckBox, which is located on the Center left of the screen. Step 25 Tap on the "Delete after export" CheckBox, which is located on the Center left of the screen. Step 26 Tap on the "Cancel" Button, which is located on the Center left of the screen. 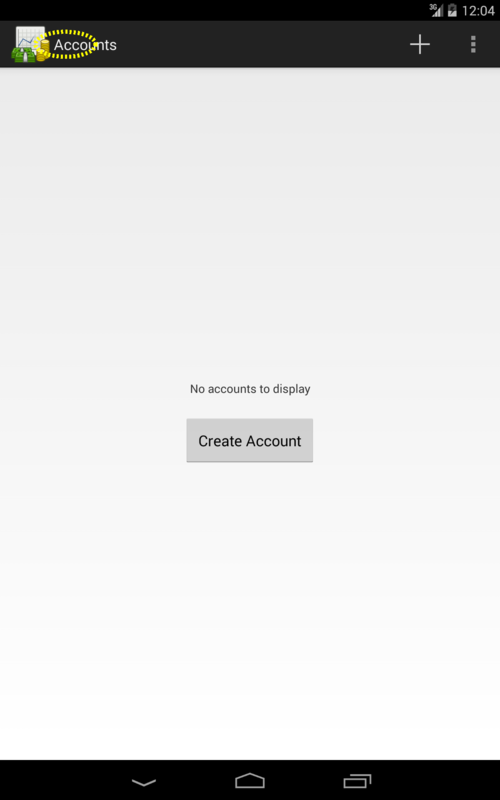 Step 27 Tap on the "Create Account" Button, which is located on the Center of the screen. Step 28 Type"inhphsjgfi%sz" on the "Account name" EditText, which is located on the Center of the screen. Step 29 Tap on the "Save" Button, which is located on the Center right of the screen.